This classic alpine run takes on some of the most spectacular country in Victoria’s Alpine National Park. Starting in Harrietville and climbing up Bungalow Spur to the summit of Mount Feathertop then along the Razorback to Diamintina Hut which offer some of the most remarkable running and scenery in the Australian Alps! Then it is a descent down Bon Accord and back into Harrietville. If you are up for the 40km in distance this is one of the most amazing high altitude runs for the Australian high country! At the junction of the Razorback Track and Diamantina Spur head right and up the small hill. If you start descending into the valley, STOP and return to the ridge. NB. All runners MUST have sufficient experience/equipment to allow them to either find an alternate route back to run headquarters or wait out the night & complete the run the following day. 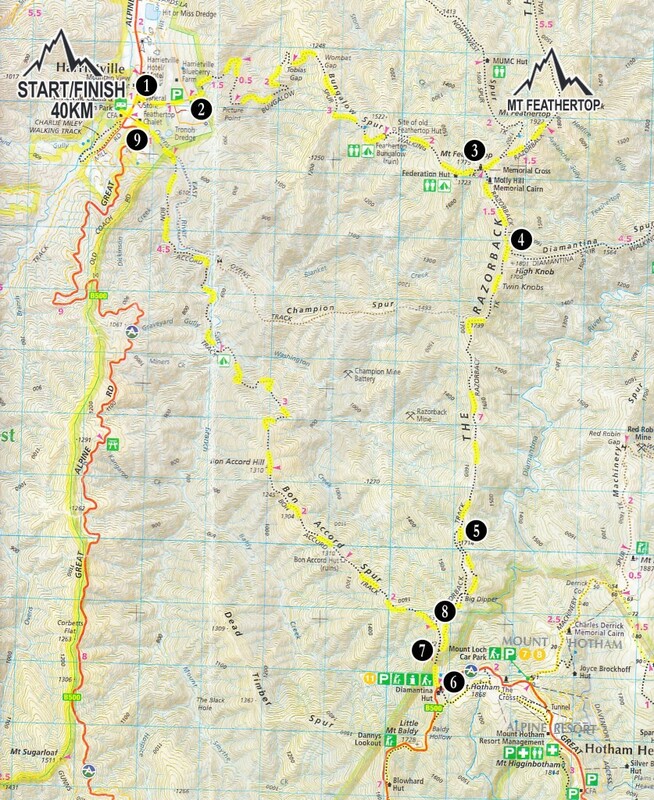 Any runner who withdraws or is unable to complete the run back to Harrietville by 9 pm on the Saturday MUST attempt to contact the run director Paul Ashton by mobile phone (0418 136 070) & advise their status.